The village of Cameley in Somerset is situated on the Bristol Road. 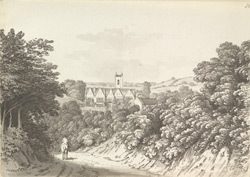 The buildings seen in this view are St James's Church and a local manor house. The west tower of the church dates from the 15th century. Much of the original interior of the church remains including several medieval paintings.